Basically, ideas for winter family getaways fall into two types: embrace the snow or run away from it. Whether it be skiing, snowshoeing or sitting by the beach with a good book, it all comes down to preference — and region of choice. Winter Vacation Ideas in the Northeast U.S. If the idea of a snowy getaway makes you think warm fuzzy thoughts, then the Northeast U.S.A during the winter is definitely the place to go. Some ideas for making the best of winter include"
Some of the features of Smuggler's Notch in Vermont include: a nursery, kids programs, two teen centers, ski camps ages 3 and up; family package covers lessons for kids and for adult first-timers; x-country and snowshoe trails, indoor FunZone, evening entertainment, tube sliding, ice skating, hot cocoa by the bonfire, and lots more. This National Historic Landmark is partners with Bretton Woods, NH's largest ski resort. Alpine and x-country skiing, 'boarding, ice skating, family sleigh rides, dogsledding and much more. Most resorts on this list are open for winter fun. Open year-round, and some make winter vacations a specialty. With over 500 acres in the Shawangunk Mountains, Rocking Horse Ranch has a long list of activities — all included, as are meals. Snow tubing and skiing in the Winter Fun Park, ice skating, horse-drawn sleigh rides to name a few activities. Think family resorts, classy places that welcome families, B&B's and more. This lodge is rustic chic, has an Aveda spa, and its own indoor water park with a water roller coaster, wave pool and more. Signature features at Great Wolf Lodges include Grand Lobby with animated Clock Tower, and nightly story time; all-suite guests rooms; Cub Club activities; “Snowland” in December. Nemacolin Woodlands: Year- around upscale resort with 2400 acres; downhill and x-country skiing. More Pennsylvania Family-Friendly Resorts: How about a Dutch Colonial stone lodge on 5500acres? Oahu: Waikiki Beach: Many family-friendly hotels including suites and affordable choices; sheltered beach; surf lessons for kids; base camp for fun outings. Maui: Ka'anapali Beach Hotel: Wonderful location on Kaanapali Beach, one of Hawaii's best; prides itself on its (complimentary) Hawaiian cultural activities; good price point. The Big Island: Hilton Waikoloa Village: With 65 acres on the Kohala Coast, the Hilton Waikoloa Village has pools galore, waterfalls, grottos, slides; salt-water lagoon with water toys and snorkeling (-sea turtles swim in); and — a novelty kids love — a monorail and canal-boats to get around the large grounds. Head to lots more Hawaii Resorts. Cancun: On the Caribbean east coast of Mexico; giant Hotel Zone; Mayan Riviera attractions are within day-trip distance. Avalon Reef Club: near busy Cancun but on its own private islet on laid-back Isla Mujeres; gentle beaches, near a friendly town. The Xpu Ha Palace: an hour south of Cancun; tropical grounds in style of an "eco-park"; thatched-roof bungalows; snorkeling in a cove; two zero-entry pools. Iberostar Playa Paraiso: giant five-resort complex 30 minutes south of Cancun. Tropical setting with birds, iguanas, even monkeys; pool complex with lazy river, wave pool, kids' pool; the latest resort is highest in luxury. Los Cabos: On the Baja California peninsula, on the west side of Mexico, is another area for all-inclusive. Los Cabos ("The Capes") has year-round warm weather, white sand beaches, good snorkeling beaches, nearby coral reef. Activities include horse riding and sightseeing in the artists' town of Todos Santos. Dominican Republic: Club Med Punta Cana: Amazing kids' programs, for many age groups; The Ramp, for teens; trapeze and many activities. Jamaica: Franklyn D. Resort: "All-inclusive" here includes a friendly "vacation nanny" for each family. Large suites; friendly ambiance. Beaches Resorts: These popular family all-inclusive frequently sell out. Nurseries; kids programs for many age groups; watersports including daily scuba; Sesame Street characters and themed activities; Single Parent months. Turks & Caicos is a flagship property. Jamaica: Breezes Trelawny Resort: This value-priced resort has mini golf, trapeze, rock climbing, kiddie pool with slide, novelty pools; kids club and nursery. US Virgin Islands: Maho Bay Camps: Something different, at the doorstep of the USVI National Park; white sand beaches, and lodging in comfortable tent-cottages. Orlando is surely the globe's biggest draw for families, with Disney World's four theme parks, two waterparks, and thirteen resorts; Universal Orlando's two theme parks and three resorts; plus other parks and attractions all agglomerated in this once-sleepy acreage in mid-Florida. The winter months — after the holiday season and before Spring Break — can be a good time to visit, especially with young kids: these weeks are among the least crowded in the parks. The theme parks won't be open late, and you'll find fewer parades and special events; but with young kids, the shorter hours may not matter much. Orlando: Mardi Gras at Universal Studios Orlando: On 30 nights, from February until April; parade, costumes, theme cuisine. Nickelodeon Family Suites by Holiday Inn: Of course there's no law that you visit a theme park in Orlando; and at this resort, your kids just might want to stay all day on the premises. The new Nickelodeon Family Suites by Holiday Inn — a.k.a. "NickHotel" — is in a class of its own: two water parks; and theme, pool games, and evening entertainment by Nickelodeon. WI: Wisconsin Dells Indoor Water Parks: This town invented a whole winter vacation season for itself, with the world's highest concentration of resorts with indoor water parks. Yellowstone National Park: This wonderful park is a place for winter vacations too, without the crowds of summertime; and what better way to visit than with your own private naturalist? Try "Lodging and Learning" packages for families, offered at a good price-point. Winter Vacations: Grand Canyon: Another great National Park that's thronged with people in summer months: visit off-season for a different experience. The South Rim stays open year-round, with several choices for lodging. NM: Hyatt Regency Tamaya Resort & Spa: This resort has 500 acres of Santa Ana Pueblo land; horse-riding; activities based on native culture; Camp Hyatt for kids. AZ: Dude Ranches: The winter months are prime time for dude ranches (which generally close during the heat of summertime.) Rancho de los Caballeros is an authentic "ranch resort" where guests can ride horses twice a day; golf, spa, and kids program, too. 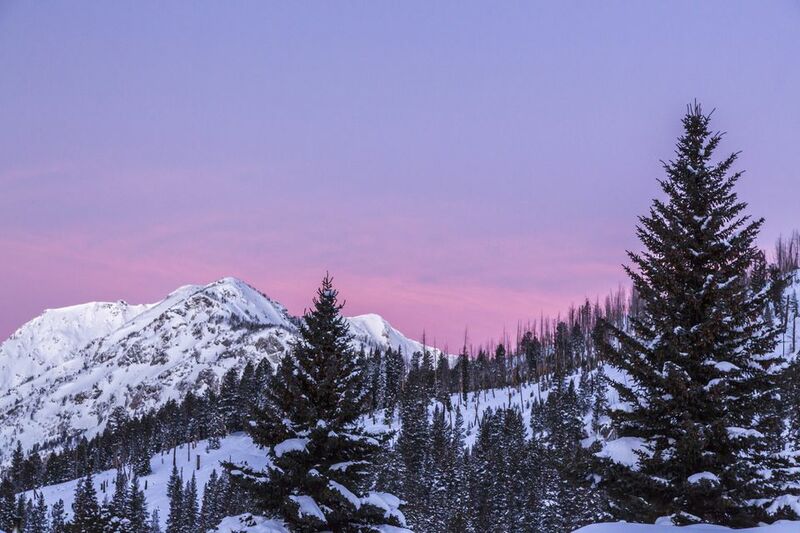 Skiing in Utah and Colorado: Utah not only has amazing snow, it also has seven ski resorts within an hour of Salt Lake City, which means getting on the slopes FAST. Nonetheless, Colorado takes the prize for the biggest and most famous ski resorts. Big Bear Lake, CA: Less than 2 hours from LA and 4 from Las Vegas, this family-friendly ski resort have 75 downhill trails and fun snow-tubing. But of course, California is more known for beach and theme parks than for snow. See other California Winter Vacation Ideas. Snow Vacations in Canada: This country does snow well, and Whistler BC and Mont Tremblant Quebec are only two of the many choices for ski and snow fun. Banff, Alberta: Lots of lodging options in the small town of Banff, within Banff National Park; and three ski resorts nearby. Picturesque drives, glaciers, dog sledding and more. Quebec City Carnival: Ice Palace, snow sculptures, music, and a chance to explore this charming city. Approx. the first two weeks in February. "Family Adventures" are a special niche in family travel: high-quality escorted tours in the Great Outdoors; winter vacation choices include Rocky Mountains, Yellowstone, Galapagos, and even Antarctica. Family Adventures are typically offered by adventure travel companies, and though pricey, deliver a memorable and hassle-free experience. Another way to have a family adventure (at considerably less expense) is a special program at Yellowstone National Park. Families have a wonderful option at Yellowstone: the Lodging and Learning programs offered by the Yellowstone Association Institute, especially for families. Below find more winter vacation ideas, far and wide. Fiji Resorts for Families: Fiji is the fantasy of the unspoiled tropical paradise. But a Fiji resort seems so far, so out of reach—Think again. Logistics and price may be more manageable than you believe. Family Adventures in Asia: Enjoy escorted tours to Vietnam, China, etc. ; all details handled; cultural experiences plus fun such as waterparks. Gold Coast, Australia: Below the Great Barrier Reef is "Surfers Paradise" with 30 kilom of beaches plus several "fun parks" such as SeaWorld and Wet 'n' Wild. Family Cruises: Known as "floating resorts", many cruise ships woo families with extensive kids' programs and lavish facilities such as water parks. Disney Cruises lays on a private island: 1000-acre Castaway Cay in the Bahamas is a stop on all Caribbean sailings, with white sand beach, water sports, bike rentals, kids programs in a play area; teens have their own beach with rope swing or can sign up for teen activities. See lots more about family cruises.